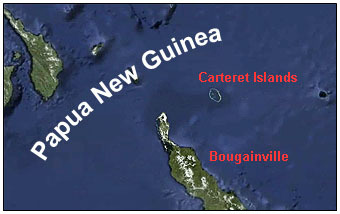 The evacuation of the Carteret Islands have begun. This morning I stood on black volcanic sand, pressed up right against the jungle, and watched a small white boat powered by a single outboard engine run in against the shore. On board were five men from the Islands, the fathers of five families, who have come to finish building houses and gardens already begun in a cleared patch of jungle at Tinputz, on the east coast of Bougainville. When these homes are ready the five will return to the Carterets, to fetch their wives and children back. Life, they hope, will be better for them here. On the Carterets, king tides have washed away their crops and rising sea levels poisoned those that remain with salt. The people have been forced to move. This is likely to become an increasingly common story over the upcoming decades, and while there are probably multiple causes, it’s likely that global warming is one of the big ones. We may be the ones causing most of the warming, but we’re not the ones who will pay the biggest price.